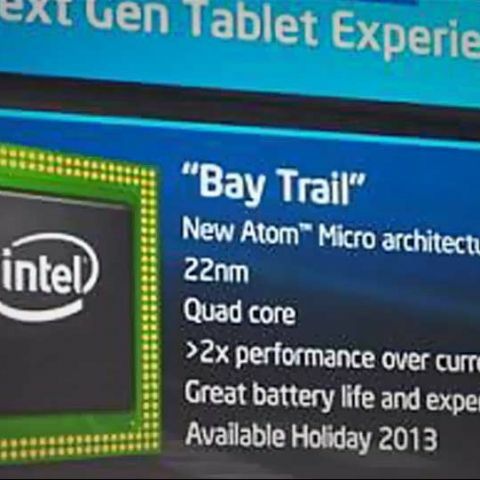 Intel has shown off the Bay Trail 22nm quad core Atom processors for tablets. This is a straight up challenge to the ARM processors, and severely dents Windows RT’s chances. Intel has been fairly busy at CES 2013 in Las Vegas. But the most important announcement is that of the quad-core 22nm Atom processors for tablets. 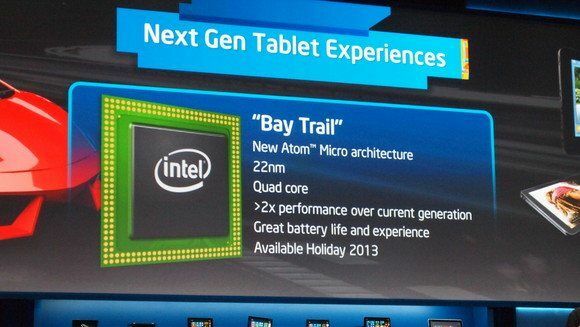 Going by the codename Bay Trail, these are taking ARM processors head-on. These processors will be available on tablets later this year, and we could see tablets as thin as 8mm. Intel claims that Bay Trail will offer double the performance when compared to the existing Medfield range of the Atom processors, the Z2760 series. Details remain scare on the actual processor and platform specs, but earlier leaks point to the clock speed hitting the ceiling around the 2.1GHz mark across the range. This will make it the most powerful Atom processor till date. "With Bay Trail we will build on the work done with our current SoC development and accelerate very quickly by leveraging Intel's core computing strengths," said Mike Bell, vice president and general manager of the Mobile and Communications Group. "We will take advantage of the tremendous software assets and expertise at our disposal to deliver the best products with best-in-class user experiences." The announcement of quad-core Atom processors from Intel will probably hurt Windows RT big time, and there are examples to prove it. Lenovo had earlier launched the Yoga 11 on ARM with Windows RT, but has shifted over to the Intel processors and ditched Windows RT in the process. Intel also wants to attack ARM in the smartphone ecosystem as well. The debut of the already leaked Lexington Atom platform points to that. According to the information shared by Intel about the smartphone processors, Acer, Lava International and Safaricom are already on board to use the Intel processors in their upcoming smartphones. Expect more big name smartphone manufacturers to slowly come on board. The Intel Atom Z2420 processor with Intel Hyper-Threading Technology clocks in at 1.2GHz, 1080p hardware-accelerated encode/decode, and support for up to two cameras delivering advanced imaging capabilities, including burst mode that allows people to capture seven pictures in less than a second in 5-megapixel quality. The platform also includes the Intel XMM 6265 HSPA modem that offers Dual SIM / Dual Standby capability for cost-conscious consumers. The forthcoming Intel Atom Z2580 processor platform (formerly "Clover Trail ") is targeted at performance and mainstream smartphones. The platform includes a dual core Atom processor with Intel Hyper-Threading Technology, and also features a dual-core graphics engine. The Z2580 platform will deliver up to two times the performance benefits over Intel's current-generation solution (Intel Atom processor Z2460 platform), and also offer better battery life. How to get into The Boot options i.e. the BIOS settings in iball Slide i701 windows, intel based tablet ?